So, initially I thought this mod wasn't working post 7.0. The actual problem is I needed to go in to the mod and check the box for "Resize Viewport" in each of the panels I'd had. Somehow in the 7.0 patch process that became unchecked for each panel. Resize viewport not working anymore? Its just squashing it. It's working fine for me, nothing has changed that I'm aware of that would make the addon stop working. Make sure you have it installed correctly. Every time I log in there are no visual changes from this addon, but when I go into the settings and toggle any option then everything comes back. I cannot get my settings to save, every time I log in I have to toggle a setting to get it to show. Ouch. I guess you used the curse client or something similar to update. Always keep a backup of the things you create. Not getting any errors, but it also doesn't seem to be doing anything. I have tried to re-add my panels that I had(have) configured but nothing changes on my screen. Maybe functionality removed? No functionality has been removed and nothing has changed (that I am aware of) to make the addon behave any differently to before the patch. Make sure it's installed correctly and enabled in WoW. Hey, how do I merge the corners neatly with each other as shown in the main image of the Emblem artwork? That is the default behaviour of the emblem theme, but if you've messed up the settings the ones to look out for are "Resize to fit". It should be "on" for the side panels and "off" for the top & bottom. I'd like to learn how to make my own custom artwork, but I don't know how. Is there a how to video I can watch? I'm more of visual person. hey there, hopefully you guys can help me figure this one out, its been an issue for quite some time. nothing that stops me from playing, but annoying enough for me to finally hopefully find out some info about it. 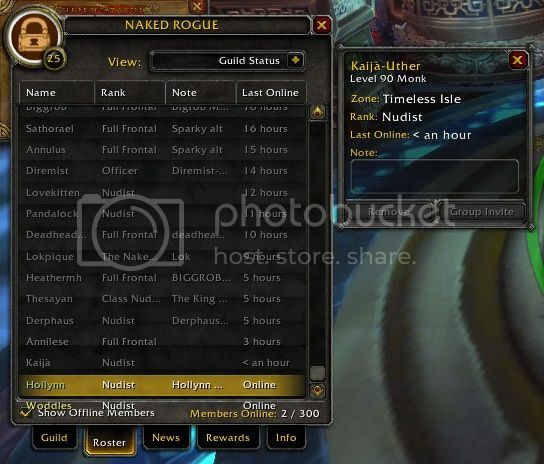 as you can see from the screenshots, the text in my guild window isnt aligning properly. i assume this is because the text is "pushed up" from my bottm bar. 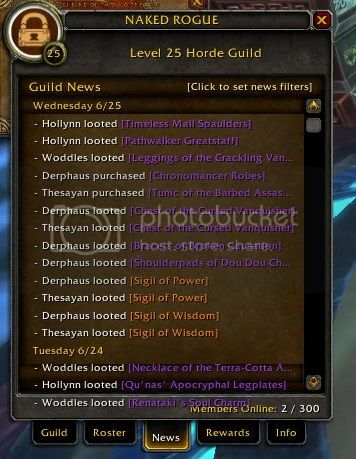 i cant think of any other mods that might be affecting this, and as far as i know, it is only my guild window that this is happening to. anyone see this before or know how to fix it? I haven't seen this problem in any of my setups and this addon does not touch any frames other than the worldframe, which is not part of the UI layers. When comparing the number of lines on my screen to yours, you appear to have one more than me but I'm not sure why. Possibly a UI scaling difference, try disabling scaling in the Blizzard System>Advanced options and see if that changes anything. it actually already was disaabled, i turned it on and moved the slider just to see what would happen and putting it at .9 down from 1.0 fixed it entirely. cant believe it was that simple lol thank you for your input! very much appreciated. I'm in search of some new sunn arts. Anyone know of any that are new or updated? Art pack 12 is nearly finished, there are lots of others on curse if you search for Sunn. Doubt it'll be added but I can dream can't I? I'd like to suggest adding a feature that allows us to add solid color lines to the panels as dividers. Sure you can add the dividers yourself via a graphics program, but each character may have a different set up. Would be much more convienent to just configure the sections in game rather than customize your artwork for each character. Hi all. I'm having a problem where some artwork does not appear. I am trying to bring in the artwork from spartanUI and have done some tweaking so it will fit on a 1920x1080 screen properly. The first 3 panels appear, but the area where the 4th panel should be is empty (black due to resizing the viewport). The file is named properly and saved in the same exact way as the other 3 panels. Any suggestions?